The streets of Helsinki fall silent during Midsummer, when many locals travel to the countryside to celebrate. Still, there is a lot to do in Helsinki under the midnight sun. Here are a few tips for celebrating Midsummer in Helsinki. NB! Many local restaurants and some of the main attractions remain open throughout the Midsummer holidays. Canoe expeditions and walking tours are also held at Suomenlinna over the Midsummer weekend. To check opening hours, see our Midsummer memo (link on the right). Traditional Midsummer’s Eve celebrations have been held at Seurasaari since 1954. This year the celebrations begin on 20 June already at 4pm. The festivities will continue all the way until one-o’clock in the morning. Visitors can enjoy a full programme of traditional Finnish Midsummer activities, including Midsummer maypole raising, Finnish folk dance and music, bonfires and horse carriage ride. Visitors can also admire Midsummer bonfires from different parts of Finland. There is a full programme for children, including story telling and music. Tickets to the Midsummer’s Eve celebrations at Seurasaari cost 20 euros, and admission is free of charge for children under the age of 15. The easiest way to get to Seurasaari is by bus 24 from the city centre. Additional services will run on Midsummer’s Eve. 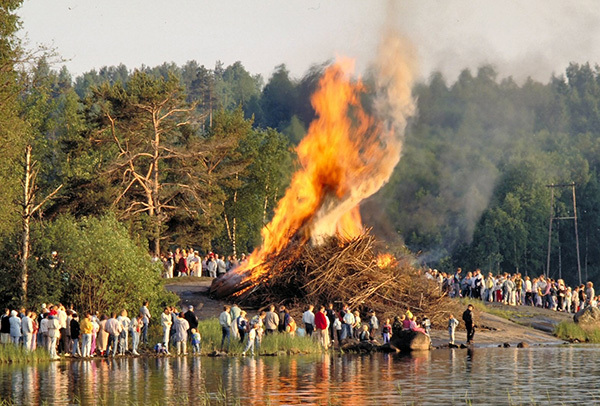 The bonfire at Pihlajasaari will be lit at 9pm on Midsummer’s Eve. The seaside terrace at the restaurant will serve food and refreshments that can be enjoyed to the accompaniment of dance music. The restaurant will be open until 1:30am, and the last ferry back to the mainland (Merisatama) departs at 1:45am. On Midsummer’s Day the restaurant will be open normally from 11:00am to 8:30pm. To get to Pihlajasaari, take the ferry from Merisatamanranta or Ruoholahti. Return tickets cost 3.50–6 euros (cash only). We Love Helsinki organises traditional Midsummer dances. The dances begin already on Thursday 19 June and will continue on Midsummer’s Eve 20 June and Midsummer’s Day 21 June in the Restaurant Kuudes linja and at Club Kaiku (Hämeentie 13, entrance in the courtyard, Kaikukatu 4). Midsummer dances at Linnanmäki amusement park will take place on Midsummer’s Eve 20 June from 7pm to 9pm. The event is free of charge. Get an unforgettable gastronomic experience while enjoying an unparalleled view of Helsinki and its surroundings at Midsummer. Dinner in the Sky event rises 22 guests at a time to enjoy food or a glass of bubbly at the height of 50 meters. The Estonian Chef de Cuisine Vladislav Djatšuk of the restaurant Tchaikovsky in Tallinn will be in charge of the kitchen on Midsummer Eve and Midsummer Day. Arlan sauna (Kaarlenkatu 15) will be open as usual from 2pm to 8pm also on the Midsummer weekend 20-22 June. Kotiharjun sauna (Harjutorinkatu 1) will be open on Midsummer’s Eve 20 June from 12noon to 4pm(5pm). Sauna Hermanni (Hämeentie 63) will be open on Midsummer’s Eve 20 June from 10am to 3pm(4pm).